We’ve all been there…many times (a week ☺) . It’s almost dinnertime, and you’ve just walked in the door and have NO idea what to make for dinner. You did manage to do one thing earlier that morning before you left though…you took a protein out of the freezer and threw it in the fridge to thaw with hopes that inspiration would hit you sometime between 6:30am and now. Alas, life happens and dinner was the last thing on your mind today. You’re tempted to just call for pizza, or jump in the car and grab some fast food, but you’re also trying to eat a little healthier and eat more at home…queue the “One Pot Wonder”. For me, being able to get dinner ready in one pot (i.e. LESS cleanup) is the way to go on busy nights like these. You already did the biggest thing and managed to have some chicken breasts at the ready, and the rest will come together in about 30 minutes or less!!! To me it’s all about having some quick short-cuts or tricks up your sleeve. In this case, it comes in the form of Trader Joe’s Jasmine Rice (in the frozen section), or leftover rice (maybe you had Chinese take out the night before…this is a great way to use that bad boy up!) 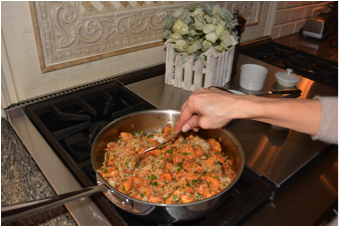 Busy weeknights aren’t the best days to make something fussy or complicated, and little shortcuts like these are a beautiful thing after work …school …practice …homework ….you get the picture, now let’s get a delicious home cooked meal on that table for you and your family! 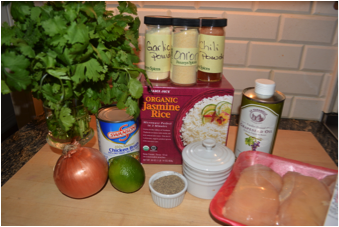 Boneless skinless chicken breasts, cooked rice, chicken broth or stock, onion, lime, fresh cilantro, garlic POWDER (NOT garlic salt), onion POWDER (sometimes called ‘granulated onion), cumin (it’s behind the onion powder in the pic), chili powder, cooking oil, salt and pepper to taste. 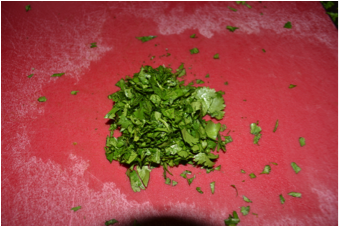 No one likes to bite into a piece of sand (gives me the chills just thinking about it), so make sure you clean the cilantro well. 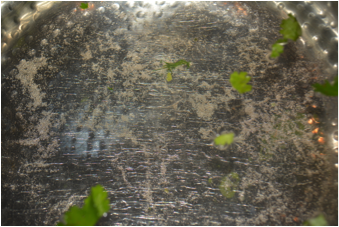 I don’t care if you bought organic cilantro – grit is grit, is grit and it’s gross! The EASIEST way to do this is just get a deep bowl or pot, throw the cilantro in (cut just above the elastic band that holds it together) and add some cool fresh water to almost the top. Give it a good ‘slosh’ with your hands to move it all around and just leave it be while you get the rest of the food ready. Then, when you’re ready, pull out the cilantro (do NOT pour it into a colander!!! The sand will follow – trust me, I’ve seen it done) and the sand and grit will all sink to the bottom. 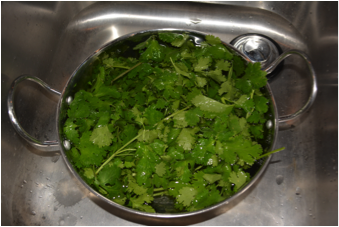 Then lay the clean cilantro out on some paper towels or clean tea cloth. Check out how much sand was at the bottom of my bowl after just 10 minutes of soaking! If I just gave it quick rinse, I wouldn’t have gotten it all out. 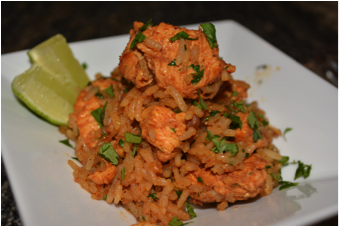 While the cilantro is soaking, cut your chicken into cubes and set aside in a med sized bowl. 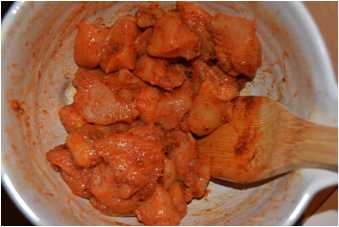 In a separate small bowl, mix together all of your spices, salt and pepper and add it to the chicken along with the juice of ½ lime and 1 TBS of oil. 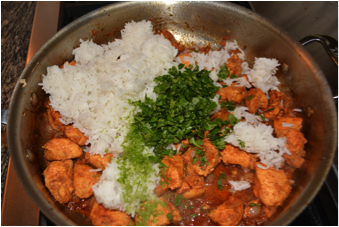 Mix it all well and let it hang out while you chop up your onions, cilantro and get your rice in the microwave (if you don’t have any leftover rice in the fridge. My onion was the size of a softball, but even though I’ll only end up using half, I still chopped the whole onion, and then put the other half in a zip lock baggie in the freezer so it’s ready for me on another night when I don’t have time to do all the chopping. 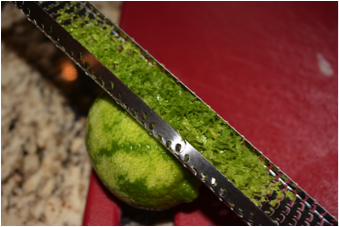 **TIP Zest the lime BEFORE you cut it – much easier that way. I zest mine with the zester upside down (see pic) so I can leave the zest in the zester until I’m ready for it since I’ll need some of the juice early in the recipe. 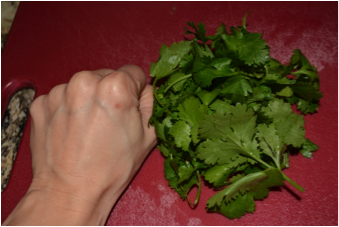 My idea of a “small bunch” of cilantro is a little bigger than the size of my fist, then mince. Preheat a large pan over med to med/hi heat. 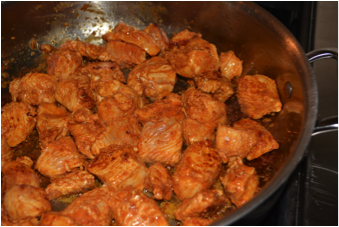 Once the pan is nice and hot, add 1 TBS of your favorite cooking oil, and add the chicken. Give the chicken one good mix so it all coats in the oil, then spread it out so that you have one layer of chicken in the pan and set your timer for 3 minutes and LET IT BE! Don’t touch – let it work it’s browning magic. What can you do in those 3 minutes? You can tidy your cook space so you don’t have a big mess waiting for you. In 3 minutes you can, put the spices away, put the rest of the cilantro that you’re not going to use back in the fridge and measure out your chicken broth or stock. 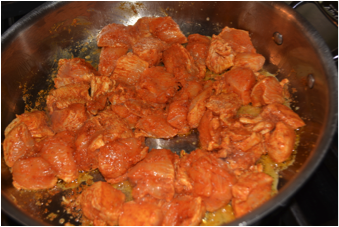 After 3 minutes, you want to give the chicken a really good stir, so that the uncooked top is more or less the ones facing the bottom of the pan, but giving it a few good stirs is plenty to do that and cook another 2 to 3 minutes and remove chicken from the pan. 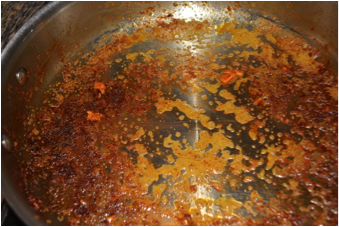 Your pan will look something like this (see pic below). 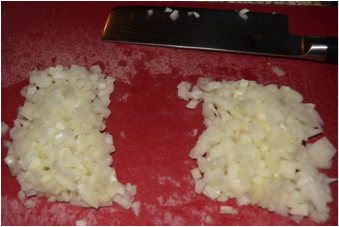 To the same pan, add a small drizzle of oil and add the onions, and season to taste with a little more salt and pepper and cook until translucent and begins to soften (about 2 minutes or so). If it’s browning too quickly, lower your heat to med. 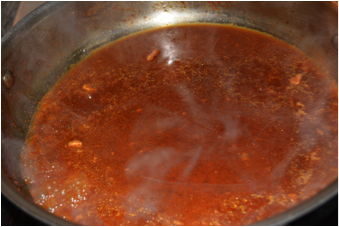 Once the onions soften up, add your broth, turn the heat back up to med-hi, stirring with a WOODEN spoon, to scrape up all of those delicious brown bits of flavor from the bottom of the pan. 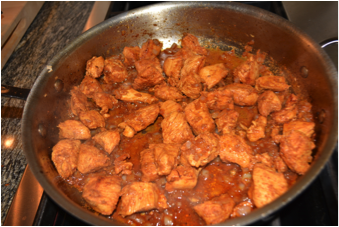 Let the sauce reduce for about a minute, then reduce your heat to low and add the juice of the other half of lime and the chicken and all it’s juices back into the pan and toss everything well to coat. 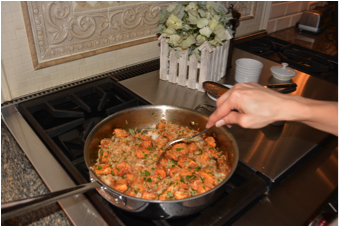 Once everything is mixed well, give a quick taste and adjust the seasoning if needed. If you want more salt or cilantro, by all means, go for it! Then turn off the heat and serve along with some extra lime wedges on the side, a crispy salad and enjoy! Xoxo! Recipe adapted from a recipe by Laura Vatali. Love her recipes by the way! – 2 large limes (you’re using the zest and juice of one, and serving the wedges of the other with dinner) **If you put the limes in the microwave for 5-10 seconds then roll on the counter with the palm of your hand, you’ll get a TON more juice! 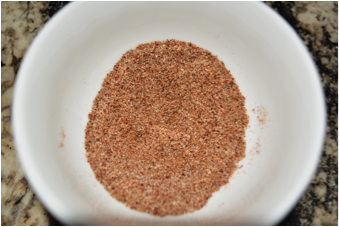 * I tend to use pretty “healthy” tsp’s because these spices will be seasoning not only the chicken, but the entire meal (rice etc…). 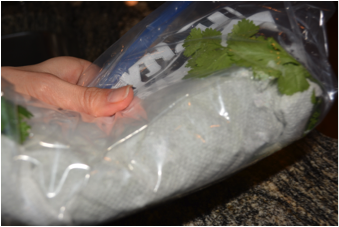 Tip: I like to you wrap the remainder of the washed cilantro in paper towels, then put in a zip lock baggie and squeeze out the air. It will stay perfect for over a week if you do it this way! And if you did this on your big grocery day, it will be ready for you when you need it! 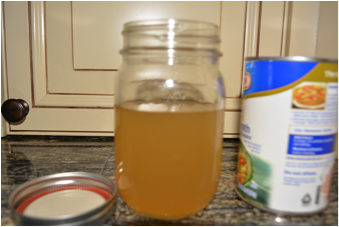 Tip: If your broth came out of a can (like mine did), transfer the unused broth into a glass jar and put in the fridge, or you could freeze in an ice cube tray to use as needed. If you just put the can in the fridge as is, the broth will take on a metallic taste. Mr. Mom Monday – Police and Vultures! !